I'll be honest, after the first several pages of The Headmaster's Wife I wanted to return it to the library unfinished. My feelings on what I was reading ranged from hate, disgust, and anger. But I had a few suspicions about what was to come from what I was reading, so I pressed on with some reluctance, if only to confirm if I was correct or not. I was correct about one suspicion only. The rest left me floored. Halfway through the book, as I trudged through some really distasteful passages (not the writing, which is good, the imagery and feelings it gave me) everything changed. It's been a long time since a book has totally shocked me—since a plot twist has completely and utterly surprised me. And at the halfway mark, I was floored and unbelieving. 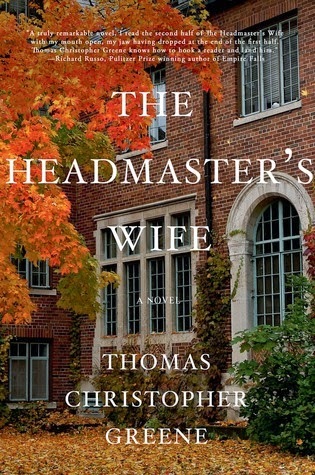 The Headmaster's Wife is written from a few different perspectives, and overall retells a lifetime. Seeing the events from different views in different points and time is what made this book the jaw dropper that everyone is talking about. This book is about it's namesake, but we learn about her from her husband, past boyfriends, and finally herself. The story takes place at the Lancaster Boarding school in Vermont— a place of old money and prestigious bloodlines. We follow Arthur Winthrop and his wife Elizabeth, (and their son Ethan) into the past, then rushing back to the present in what I can only say is "their story". But after I closed the book, having read it through quite quickly, I realized that above all, this is a story of grief and reflection and how they are handled. It's also a book about choices made in life, about being broken, and the ups and downs of marriage. Although I do not think I'll ever read this book again, after getting to know Elizabeth I felt like I could relate to her on many levels. She and I have had a lot of the same reluctances, thoughts, and feelings about life and love and success. Actually, I think a lot of women do, and the whole experience of relating to Elizabeth felt raw and honest. But mostly I could connect to her on her devotion and love to her son. (Or like how she thought she would hate breastfeeding, but ended up loving it.) In the end, we find that we live for our children, so engrossed in our love and devotion to them. I thought that Greene really nailed some of the feelings on motherhood. There is a rawness to the entire story that connects to the parts in us that we rarely disclose to others. The thoughts we keep to ourselves. I think a lot of people will understand those parts deeply, in the ways we feel about decisions we've made in life, the hurts and also the joys. Finally, I realized I felt all these things, went on this journey, and forgot that I was reading. The words are written so smoothly and so realistically, you forget that they are coming out of a book and are not a part of you already. And that is where I can agree that the writing is simply artful. Maybe the most obvious drink for this book would be wine, since it's flowing on every page. Wine or scotch. But the wine also represents heavy or sorrowful memories, and I wanted something light and innocent instead. Something to balance everything out. But I realized that drinking something that represented innocence (like maybe apple juice) might feel wrong too, given many scenes in the story. So I opted for something that could comfort, and maybe hold a bit of innocence too: drink with hot chocolate, your favorite flavor.